1Ls, join CLWA and Paul Weiss for a fun dinner where you will have the chance to speak informally with female partners and associates about their careers and experiences! This is a great way to network with prominent female attorneys. Join CLWA for a Women in Firms panel. The panel will include Partners and Associates from eight New York City law firms, and will consist of a moderated Q&A with questions about a variety of topics including work/life balance, summer associate tips, first year tips, and career trajectory issues. Join CLWA and Ms. JD for a lunch conversation with Lauren Stiller Rikleen, founder of the Rikleen Institute for Strategic Leadership and executive-in-residence at the Boston College Center for Work and Family. Ms. Rikleen will start the conversation with a short talk on strategically navigating the early years of one's career and effective inter-generational communication and then take questions. RSVP to Mia Khatcherian at mkhatcherian@cgsh.com with the subject line "CLWA Fireside Chat"
We are excited to announce our first career event of the semester! Please join attorneys from Cleary Gottlieb at The Mermaid Inn on Monday, February 13th, at 7 pm. Cleary will be hosting a dinner and informal discussion about life at a large law firm. This is a great and fun opportunity to talk to attorneys from a leading firm in an informal, personalized setting! We hope to see you there! If you have any questions, please contact CLWA's Career Chair, Hallie Damon at htd2107@columbia.edu. CLWA invites mentors and mentees to gather together for a delicious Thanksgiving meal. CLWA will provide the turkey, and mentor-mentee pairs will sign up to bring sides dishes and desserts. More details and a sign-up sheet to come! Join the Columbia Law Women's Association for summer job advice from 2Ls and 3Ls and hear all about their summer job experiences. Non-pizza lunch will be served! CLWA will be holding a panel geared toward 1Ls with 2Ls and 3Ls talking about their 1L summer job experiences. This will be a wonderful opportunity to get students' perspectives on how to find a great summer job, when to start looking and applying, and how to decide what area you want to try out over the summer if you are unsure about it. At the end of that panel, we will distribute a list of where the panelists worked during their 1L summer and their contact information, so you can reach out if you are interested in learning more about their experience! Join the Columbia Law Women’s Association for a brief meeting on this Wednesday at 4:20 in JG 106 to learn about upcoming events and how to join! CLWA conducts a mentoring program where 1Ls are matched with 2L and 3L students with many fun events planned for the year. CLWA also hosts panels on summer jobs and journals, hosts reading group lunches with faculty members, hosts an annual Women in Firms panel, sponsors the Myra Bradwell dinner in the spring to celebrate women in the legal profession, and many more exciting events throughout the year! Additionally, 1Ls will have the opportunity to apply to join our board as 1L Representatives. Come to learn more about CLWA, our upcoming events, and how to get involved! Membership dues are only $20 per year or $45 for all three years, and will be accepted at the meeting – so bring cash or your checkbook with you. If you can’t make it to the meeting and would like more information about joining CLWA, please don’t hesitate to contact Abby Branigan atamb2315@columbia.edu or Kristen Lovin at kel2125@columbia.edu. CLWA is an active organization which puts on a wide variety of events throughout the semester. Look below to learn about some of the past events CLWA has put on. Past Event: Second Annual Brooklyn Bridge Bash! CLWA members and incoming 1Ls enjoyed a walk across the Brooklyn Bridge along with a Picnic in the Brooklyn Bridge Park. CLWA and 2L representatives from the journals presented an informal panel on life as a 2L staffer on Columbia’s many journals. The panelists spoke about their experiences and then break off into small groups to answer individual questions. 1Ls asked many questions about the journal experience, and were glad to benefit from the other staffer's experience. CLWA's annual Women in Firms event began with a moderated Q&A panel and concluded with an informal networking reception. Women from all three classes at CLS attended and found tremendous value in the advice and stories offered by the panelists. Past Event: Wear Red for International Women's Day. March 8th is International Women's Day. On this day, Women and men throughout CLS came out in support for women's rights by wearing red-- red shirts, scarfs, dresses, tights, and hats were all spotted in the school. Additionally, presentations, posters, and movie screenings increased awareness of women's rights and their struggles here and all over the world. Dr. Maggi Walker, psychologist at CPS, conducted an informal discussion of issues as they relate specifically to women in the legal profession. On Friday, we kicked off the spring semester as members reunited with your mentor/mentee over bagels and pastries! CLWA members had the opportunity to join attorneys from Cleary Gottlieb for an on-campus event. Cleary hosted a dinner and informal discussion about life at a large law firm. It was a great opportunity to talk to attorneys from a leading firm in an informal, personalized setting. CLWA Reading Group Lunch with Shaireen Rasheed. Female gentile mutilation (FGM) is a centuries-old harmful traditional practice that affects up to 140 million women and girls around the world. It is considered a severe human rights violation and the World Health Organization classifies the practice as a reflection of deep-rooted inequality between the sexes and an extreme form of discrimination against women. FGM involves the removal of various parts of female genitalia and is carried out across Africa, some countries in Asia and the Middle East, as well as in locations where FGM-practicing immigrants reside, including the United States. Directed by Emmy Award® winner Paula Heredia and produced by Equality Now, AFRICA RISING travels through remote villages in Burkina Faso, Kenya, Mali, Somalia and Tanzania. It shows how courageous, creative and resourceful African women and men are putting an end to this human rights violation and changing the course of history. See the website for more information. Sponsored by the Youth Justice Association with support from: Columbia Law Women’s Association, Columbia Society for International Law, Health Law Association, Law Students for Reproductive Justice, SIRR, DVP and RightsLink. CLWA held a 1L Summer Job Panel to connect 1Ls with 2Ls and 3Ls who did interesting things their 1L summer. The event featured panelists who worked at a variety of different organizations, including the U.S. Attorney's office, a large public corporation, a human rights organization abroad, a direct legal services organization in NYC, and the federal judiciary. Check out the News page for an overview of this event. Past Event: Reading Group:"Beyond Equality?" Associate-in-law Jessica Clarke presented her paper, "Beyond Equality? Against the Universal Turn in Workplace Protections"
Mentors/mentees and other members of CLWA met up at the Mentoring Kickoff Event. They enjoyed wine, cheese, and dessert. Professor Franke led a discussion on her article, "Ahmadinejad Comes to Columbia". It was the first gender law reading group of the semester! Go to the Articles page to download a copy of the article. Interested students came to this meeting and learned about CLWA, our upcoming events and how to join! To learn more about joining, please contact us. 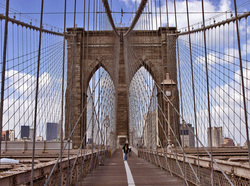 Far too many people (law students, in particular) spend months or years living in Manhattan without having walked over the beautiful Brooklyn Bridge--but not CLWA members. We enjoyed a lovely brunch in Brooklyn Bridge Park (gorgeous views of the Manhattan skyline). New students meet each other and current CLWA members.